Mobilizing communities and support in formation of community based institutions is one of the high priorities of PEACE project. Overall, the programme has been able to form, support and institutionalize 12,154 community based institutions (3,820 women) covering 263,097 members (100% of targeted households in 7 districts). 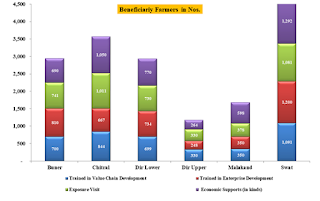 Further to the social mobilization and institutional development, the programme has federated 5,023 community based organizations into 1,092 village organizations (341 women village based organizations). 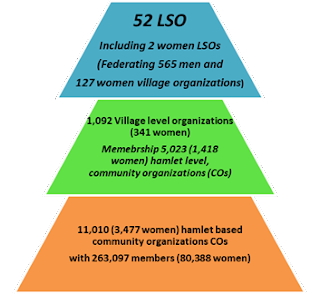 These village organizations were further federated into 52 apex level Local Support Organizations (LSOs) at union council level. Formation of highest level community institutions (LSOs) is in congruence with programme eliciting federation of three tier institutions at union council level. Accountable to members of participating village and community based organizations, these LSOs are likely to take charge of development in respective areas and be a conduit between development partners/agencies and local communities. Capacity building of men and women office bearers is in process and so far over 54,625 (18,707-women) activists are trained in technical and managerial skills. The focus and efforts of the programme is to mainstream poor and vulnerable population in development process and this is verified from the fact that 50% (130,000) of organized members are either from extreme, chronic or poor categories. It is not only poor and vulnerable but women in target areas are also encouraged to participate in the programme interventions, which is evident from formation of 3,820 women community based organizations covering 83,388 women members. Formation of such institutions in patriarchal and religiously charged Malakand division could be termed as one of the major achievements of the programme. Besides creating ‘effective spaces’ for social interaction, these organized forums have also contributed in socio-economic development of women and their families in Malakand Division. In terms of youth development, a flexible approach has been adopted encouraging youth from programme and non-programme union councils, school going or out of school youth to participate in planned activities and events. So far, the programme has been reached 39,899 youth through a diverse range of activities. Diversity in these activities; physical, environmental, intellectual, awareness and cultural, can be termed as a distinctive feature. EU-PEACE programme has successfully initiated and completed targeted 165 MHPs in six districts of Malakand Division producing 21.2 megawatt electricity. 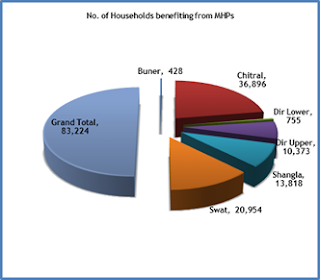 Through these MHPs over 83,000 households (624,000 population) were provided with renewable, clean and sustainable energy, which has reduced usage of fossil fuels, besides reducing pressure on precious forests. The environmental and economic benefits of these micro hydro projects are worth-mentioning. The current portfolio of 165 units producing 21.2 MW has been a major contributor in reduction of CO2 emissions by 69,000 tons/year. Similarly, these 165 units have reduced cost incurred on kerosene oil from 3 million to 0.34 €- a substantial economic benefit to local population. Interestingly, productive use of sustainable and renewable energy has gained recognition in areas where micro hydro projects have been established. Women and men businesses have flourished (e.g. dried red persimmon) with useful returns (up to 156% increase in income) to further support their families and improve their livelihoods. These MHPs have also contributed in promoting social cohesion at local level especially in post conflict scenario. Community members (16,000 in nos.) from diverse backgrounds and different economic classes/categories have come together at local level to manage and run these MHPs. Availability of uninterrupted electricity has profound impacts on benefiting local economy and improving social sector services. In one of the most famous tourist spots (Kalam Valley), local hotels are now connected to EU-PEACE MHPs benefiting nearly 1000 tourists/day in summer season. In absence of renewable/sustainable energy these hotels were compelled to use diesel/gasoline based generators, which on one hand had a negative impact on environment while on other it was heavy on pockets thus cutting down profits of local hotels. 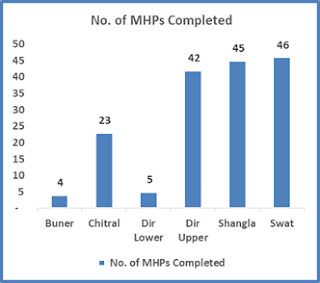 These MHPs have also promoted over 1,500 local enterprises (flour mills, welding machines, gasoline station, grocery shops etc.) to generate local employment and benefit local economy. Field data reveals that 120 boys’ and girls’ schools with a total strength of over 22,000 children are connected to especially larger units established under EU-PEACE. The computer labs are again functional and electricity is available to make class rooms comfortable in harsh summers or winters. Furthermore, at-least 3 hospitals and 14 Basic Health Units are also availing services in programme areas catering to needs of over 1,000 patients per day mostly women and children. Availability of electricity at BHUs has ensured availability of vaccines and operationalizing pathology lab at local level saving travelling time/cost. Through an access to un-interrupted electricity, living conditions of programme beneficiaries have improved substantially. New gadgets including washing machines, butter churners, satellite televisions, computer, cell phones, fans etc. have been acquired by community members which has resulted in adding to, especially women’s, comfort and access to international media for infotainment. In accordance with local norms and culture, SRSP started its interventions with a meticulous approach under the PEACE programme that paved way for other women activities in patriarch and religiously charged Malakand Division. To be relevant to local context while keeping pace of activities at optimum level, EU-PEACE developed 507 women master trainers to facilitate formation of community based organizations and undertake women interventions under PEACE programme. With this new woman work force, noticeable achievements, if not amazing, have been observed. 6,036 women have been provided with basic literacy and numeracy skills through establishment of 240 Adult Literacy Centers (ALCs). To engage women in economic development and become an earning hand, the programme has constituted 91 Business Interest Groups (BIGs) covering over 1,500 women entrepreneurs’ along-with identification of potential trades. In addition, women staff also identified 8,000 potential/existing entrepreneurs within women community institutions. Encouragingly, 7,830 of the identified 8,000 potential/existing entrepreneurs have been trained by EU-PEACE programme. On one hand basic enterprise development skills were imparted, while on other skills of existing/potential entrepreneurs have been refined. This resulted in establishing new women led businesses in Malakand division providing decent earning opportunities to women. Upon successful completion of skill development trainings, 6,001 trainees were provided with livelihood resources or tool kits to establish economically feasible and financially viable small scale businesses.